Today, Archie comic has revealed the first cover and info on the Sonic Genesis saga. The comics story appears to be a retelling of the very first Sonic game. Is this an entire reboot of the series or just a short story to celebrate Sonic’s 20th anniversary? Also, green eyes and pot belly combo FTW! Sonic investigates the strange disappearance of woodland creatures and discovers the man behind IT ALL! What is he hiding? What is the truth that has been kept from Sonic? Where did the army of badnicks come from? It’s an all new beginning! The mixture of classic and new Sonic is awesome. I’m surprised that no one thought to do this prior. Spaz is THE best Sonic artist, period. This is remind me of Sonic the Hedgehog 4 artbox. Ima get me summa that! Hyuk. I find this QUITE interesting; my interest has been piqued! Also, is anyone else having trouble posting comments? Seems to take forever. Jason – All Comments have to be approved by the editor of the post. Sometimes that can take awhile if say, they’re at work. I really hope they don’t start over from the beginning. Oh very nice cover art!! I bet you 20p that issue becomes very sought after in the future. This should so be the new Sonic game model!!! “BAWWWW!! GREEN EYES!! !” Just kidding.. but seriously, that’s an awesome cover. And if Pat Spaz is drawing more then just the cover, that would be just as awesome. I’ll be glad to check this out when it hits the comic shops. If they’re doing what I think they’re doing, I had this suggestion, too! I was gonna e-mail Ian Flynn this idea: Destroy the the current storyline and start anew, because most of the readers are under ten(seriously, look at the fanart pages) and they don’t know what has been going on for the last 100 issues! Just do a comic that was meant to be: Sonic and his friends(JUST the game characters, no freedom fighters from 15 years ago, no matter how popular they are, and no ‘official fan characters’ like Scourge, Mina, Julie-Su, ect. )foiling Eggman(the REAL one, not some alternate robotic whatever from another dimension)’s plots, and going on adventures. The comic currently has so many characters that Sonic barely appears anymore. This cover and intro looks like the start of that, and even if my idea never goes through, i’m all for it. And that was my rant, ladies and gentlemen. Thank you. Because we ALL like that pose and we ALL love seeing the same story over and over. But this time, actually based on the games. Please don’t let any Archie characters be there. Something about this DOES seem kinda familiar… not really sure what it’s from, though. Oh! Right! How could I have been so stupid. That background and the pose Sonic’s doing is inspired by a quick scene in Sonic Pocket Adventure, I think. 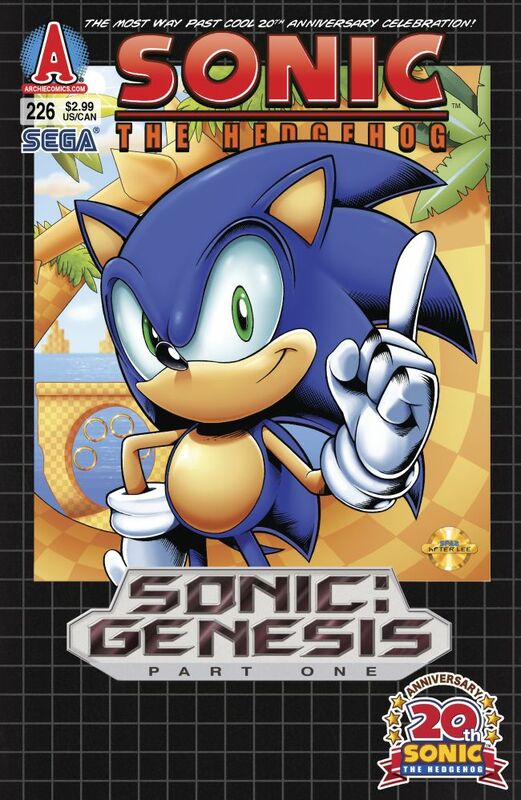 Genesis part two is probably a mock up of Sonic 2’s cover. I’m calling it. And they couldn’t make a combination of Sonic’s look like this in Sonic 4 why? Ah well. Good work Archie. Wait, are they rebooting the entire thing?! What about the progress they made so far? As exciting as this sounds, I’m kind of worried that they’re doing this with the main series instead of starting a spin-off series. I’m glad they’re re-visiting the glory days and all, but what are they going to do, drop everything and just start over? I liked the fact that Sonic is older now, by starting over, this would require that he get back to his starting age and not knowing any of his friends, unless they plan on doing some sort of new-age translation of the old games, which I wouldn’t mind I guess. In fact, that sounds kind of exciting. WIN!! Although it doesn’t exactly give clues to the story using the original Sonic the Hedgehog box art is a definite win. Also it’s great to see Yardley in the artist section. Well if they called it ‘Sonic : Megadrive (part 1)’ it wouldn’t make sense. Segway moment and sonic comics don’t come to Australian Newsagencies anymore WTF!! This’ll be a collectible issue! That… that is amazingly refreshing. genesis-the beginning of something. I wonder if there going to just ditch some characters and start over…like others have thought… if so,what effects will it have I wonder? How changed will the comic be? Also that is my absolute favorite version of sonic,old with new! I’m guessing its a one-off mini-arc for the 20th anniversary, if it were a reboot it would most likely go back to issue 1. Please be a reboot, the comics have been going downhill since issue 160, with bad repeative storylines (heroes and villains team up etc etc) just have sonic the hero, battling robotnik. in the end sonic the comic got everything perfect for a sonic comic, sonic remained the main, there was small ammout of main cast : sonic, tails, amy, knuckles,johnny, poker. with sub cast only being : the chaotix, shortfuse and tekkno. robotnik was the villain from start to finish, it stayed as mobius from start to finish, no stupid team ups, they even made chaos a dark creature killing off one of the main. evil super sonic was a bonus, because when hes super in that comic both sides are screwed lol . thats kinda one reason im alittle bit unhappy with super sonic in the games, because when sonics super you know its over. but seriously reboot the series and add character development theres never been any development in that comic, they all act the same and theres no grey in the comics, its just heros, villains and anit-heroes but in the end there all heroes with all thous stupid team ups saving the world etc ….. I hope they will tell the real story of animal batteries instead of Eggman/Ivo Robotnik transforming them into machines. Better don’t have any archie characters also. I wonder Sonic and SEGA All Stars Racing Arcade will get release date: March 2011. Likely some arcades like: Chuck E. Cheese’s, Dave and Buster’s, Nathan’s, some arcades, Fun Time America (New Jersey), and many other arcades. This arcade version will be crap of Mario Kart Arcade GP 1 & 2. Though I do wonder what Ian has store… I doubt it’s a complete reboot, he said time and time again he wanted to do one, but just couldn’t. Unless Archie finally let him do it. In which case, we can’t know what to expect. AT ALL. And it’s pretty much a given the comic characters will still be there, I mean… If they didn’t exist, would the comic be as long-standing and successful as it is today? Plus, I doubt Archie would allow Ian to nix them completely. I won’t get the chance to read it though…..Still I’m loving that Cover… And Yes Green Eyes FTW INdeed!!!!! IT’S NOT A RE-BOOT Ian has made that perfectly clear in the past all iam thinkin is that they have said the the SILVER arc and GENESIS arc combine and SILVER has a TIME STONE maybe timetravel is the key element here? Who on Mobius could be stealing the woodland creatures? I don’t think it’s a reboot or a short. The series is too popular for a reboot – if they wanted to do that, they could always launch it as another book. And a short story would be better suited to Sonic Universe. I’m guessing that Eggman starts to play some interdimensional games or mind games with Sonic, and we won’t know what’s going on for a good few issues, which will hopefully make for some interesting twists. I’ve always hated Archie’s.. But this is awesome. The only time I’ve seen this mix in a licensed work was from Sonic the Comic. A true adaptation? Well, as true as Archie gets with its mixed up wannabe SatAM universe. The early issues weren’t adaptations of Sonic 2. I love the cover and im really surprised fan boys haven’t made a comment about how sonics eyes are green on the sonic 1 cover remake…. … The entire cover however! That’s a problem. If you were to combine the Classic Sonic with Modern Sonic, this is a terrible interpretation of it. I’m sorry but this art was done poorly and seems to have been rushed if anything. Yes, I understand its another remake of the Sonic 1 cover art, but by those standards, it’s still quite ugly. Darn it! They took my idea! I don’t see the “rushed” or ugly traits u mention on this cover. The only problem I have with the cover is that the shading is little thick but otherwise it’s a pretty well rounded cover with a mix of the modern and classic style. If Sega wansnt so hell-bent on everything having the modern looks i’m sure the cover would’ve just had classic pot-bellied Sonic with mickey mouse black eyes. Maybe it’s just me, but i think his head is too big in relation to his body. Thats a pretty good cover. Good work on it. I love that they’re trying to do a comic version of the Genesis games -and I’m a newer fan. The only thing that bugs me (please don’t shoot me) is that Sally and the Freedom Fighters are a part of it. I know they’re a big part of the comics, it’s very core, but it’s Genesis. I was hoping for something right along the game, and instead it’s all about Sally and Sonic. And Antoine and Boomer. There’s nothing I can do about it, but I was just… Disappointed by that part. Can’t wait to see the second part though! Sonic “meets” Tails!! !